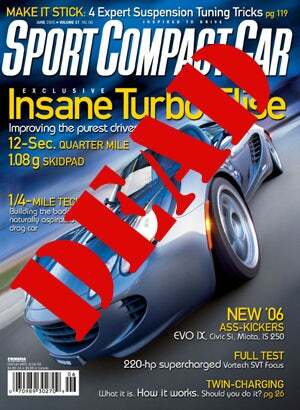 We've been able to confirm that both Truck Trend and Sport Compact Car magazines, august titles from the the sprawling Source Interlink automedia empire, have been killed by their publisher. Word is up to 115 employees were notified yesterday that their services would no longer be required. A former employee tells us that, if this is true, it would mean multiple titles were also canned. We've heard that many of these publications were profitable in recent years, but in a down economy it may be hard for one company to justify publishing 4Wheel Drive & Sport Utility, 4Wheel & Off-Road Four Wheeler and Off Road magazines simultaneously. No one at Source Interlink has returned our calls, so we're currently in the dark as to exactly which titles were cut. (UPDATE: We hear that Modified Luxury & Exotics also got the axe) Anyone who knows, perhaps a former employee, should feel free to drop us an anonymous comment or a tip to tips at jalopnik dot com. How does this impact Motor Trend, the jewel in Source Interlink's crown? We're not sure, though up until recently we've heard that Angus Mackenzie, Editor-in-Chief of Motor Trend, has proclaimed that the magazine is awash in cash, allowing him to spend money on more writers and more features. Perhaps with the reduction in operating expenses Motor Trend will have some money to spend on their website.